This guide begins in the mid-1960's, which was very close to the end for the Western Maryland Railway. This is not meant to be definitive. If you are modeling a certain locomotive or piece of rolling stock at a certain point in time, please refer to prototype images taken as close to the modeling point as you can to obtain the most accurate details. Lettering on many railroads have small variations from year to year and from paint shop to paint shop. This is a general review of the Western Maryland painting and lettering practices. 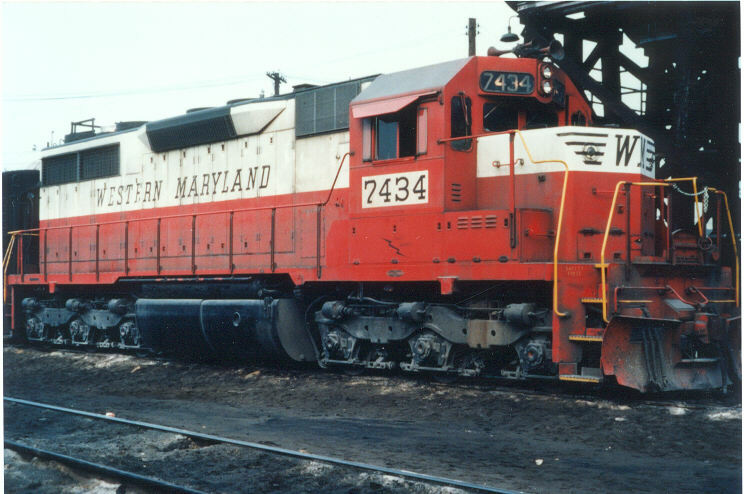 In the mid-1960’s the railroad began painting diesel locomotives in red, white and black colors that were quite different than the traditional black. The locomotive paint scheme is known as Circus Colors among railfans. 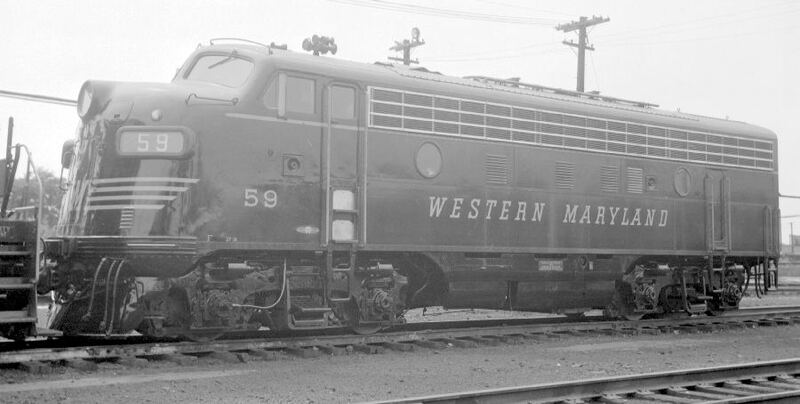 In 1954 near the very end of WM steam locomotive operations, the railroad shifted to a new lettering style splashed across rolling stock and locomotives. The lettering style became known as Speedlettering. In 1947, the WM received twelve new steam locomotives of the 4-8-4 wheel arrangement. These came with a splashy emblem on the tender that became known as the Fireball. Soon after, the Fireball emblem was applied to nearly all WM steam and diesel locomotives. In the mid-1930’s, the WM received new steel cabooses. These were the first to wear the Fast Freight Line emblem. This emblem became standard on most WM rolling stock and lasted until the Speedlettering was introduced in 1954. The Fast Freight Line emblem wasn’t quite new with these cabooses. It was a slight modification of a circular emblem that began to be applied to new and rebuilt hopper cars in the early 1930’s. This emblem was similar to the Fast Freight Line emblem, except the center was blank. The words Fast Freight Line were not used. 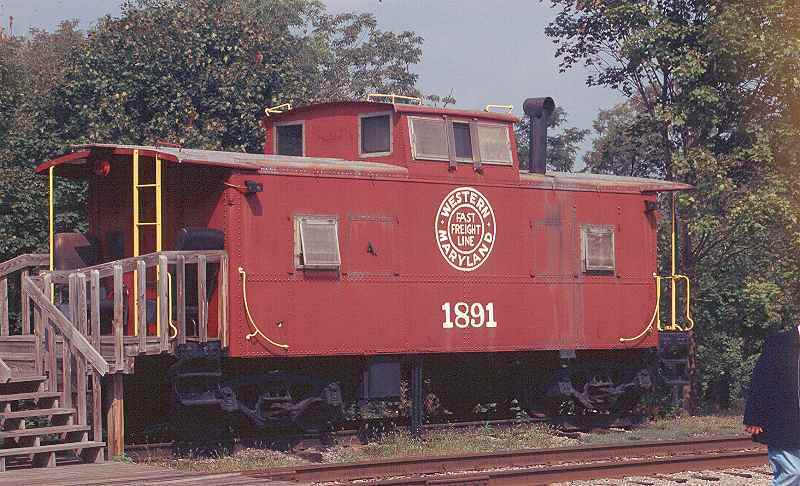 Before the 1930's, the Western Maryland name was written out on most rolling stock, similar to the coal hopper model at right. A very early emblem appeared on some locomotives and rolling stock that looked like an M stacked on top of a W in a circle. I’ve heard this referred to unofficially as the Montgomery-Ward emblem. The use of this emblem may pre-date World War I.